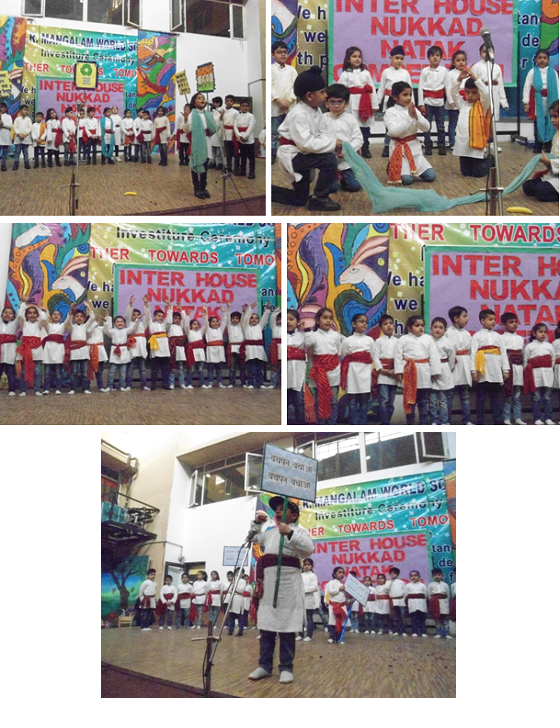 On 21 December’15, Nukkad Natak competition was held in K. R. Mangalam World School, Paschim Vihar. All the houses choose themes apt and relevant to the present day times. The hard work of teachers as well as the students was reflected in the performances. All the students gave very expressive and eloquent renditions. The participants seemed to enjoy their performances. Beats of dholki, dhapli, jingles, dupatte, loud throats, aggression and last but not the least the humor, stunned the audience. Each natak put forward many questions, few answers and most importantly a message that was delivered by every Natak. The audience also gained a lot from touching and symbolic issues taken by the houses. The judges applauded all the participants and were impressed by innovative and sensitive presentations by the young children. Finally, Ruby house was declared first followed by Sapphire which stood second.